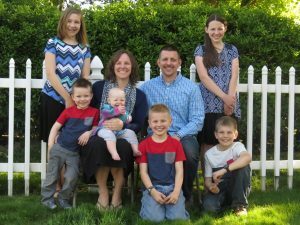 Pastor Nathan Gipp and his family moved to Lewiston in October 2012 after he accepted the position of Pastor in August of the same year. He was born in Massillon, OH, and is a football fan through and through. He was raised on the road traveling with his family all over the lower 48 states. His father is an evangelist. At the young age of 5, he accepted Jesus as his Saviour. He still remembers the day, October 13th and the old blue couch he knelt at with his mom like it was yesterday. Shortly thereafter he felt the call to preach at age 8. His dream was to attend Pensacola Bible Institute in Florida to learn the Bible. The Lord allowed it and he graduated in May 2001. While there, he met his wife, Rose and they married a year later after she graduated from the same college. He answered the call to be Associate Pastor of Emmanuel Baptist Bible Church in Martville, NY. He and his wife served the Lord happily there for 10 years. Their family grew with the addition of 2 beautiful girls and 2 lively boys! During those years, Nathan felt God directing him to be a full time Pastor without fully understanding how God would answer this prayer. He truly feels the blessings of God as he can look back and see how God has answered the prayer and brought him to Lewiston. Since settling in town, another healthy boy and beautiful girl have been added to the family. Lewis-Clark Valley Baptist Church was started over 10 years ago by Matthew Burchard and his family. Along with a few families from a sister church, Treasure Valley Baptist Church, they started in a local hotel. After a few years, they were able to purchase the current property where we are located and still worshipping today. Pastor Gipp’s desire is to build stronger Christians who are seeking the Lord daily. A personal relationship with your Saviour is key to a successful Christian life. This is what he believes and preaches. We look forward to see what the Lord will continue to do with Lewis-Clark Valley Baptist Church!